In a cruel desert, slaves toil in chains. Their masters, seraphim with haloes and swan wings, drive them mercilessly with flaming whips. But long ago, these wretched, beaten people were not slaves. Long ago, they could become dragons. Now they fight to fly again. 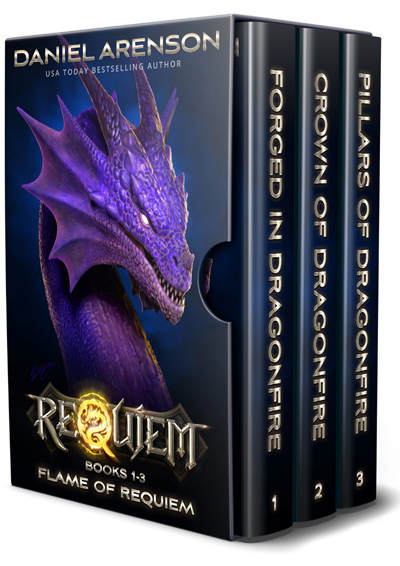 This bundle includes all three novels in Flame of Requiem, an epic fantasy trilogy about memory, freedom, and dragonfire. BOOK 1: FORGED IN DRAGONFIRE -- For centuries, the slaves have toiled, serving the cruel seraphim. Their ancient home, the mythical Requiem, lies in ruin. Their magic, the ability to become dragons, is lost. Yet now a group of slaves vow to rise as dragons again. BOOK 2: CROWN OF DRAGONFIRE -- In the pits of slavery, a savior arises. Her people march behind her, vowing to remove their chains, to return to their lost homeland. They tell their seraphim masters: "Requiem is free. We will fly as dragons again." BOOK 3: PILLARS OF DRAGONFIRE -- The slaves rebel, seeking to remove their cursed collars, to reclaim their lost magic, to find their ancient homeland. Yet their masters, the mighty seraphim, vow to break them . . . or slay them all. Can Requiem rise again?